At Emery Medical Solutions we specialize in mammography services for Apopka and all of Orlando. 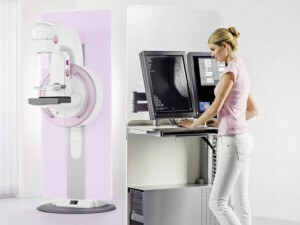 Mammography is a specific type of imaging that uses a low-dose x-ray system to examine breasts. A mammography exam, called a mammogram, is used to aid in the early detection and diagnosis of breast diseases in women. Now with Emery Medical Solution’s new MAMMOMAT Inspiration, women can see for themselves how easy and uncomplicated getting a screening mammogram is. The primary advantage of MAMMOMAT Inspiration is low dose. To match the breast density and body profile of your patients, it offers three anode/filter combinations. Opdose® automatically selects the best possible anode/filter combination and the lowest possible dose for the individual breast characteristics. The design of MAMMOMAT Inspiration is one of a kind. Its smooth round shapes and clear lines are emphasized by the soothing cover colors. MAMMOMAT Inspiration’s individual style was assigned with the renowned reddot Award and the IF Award. Digital mammography, also called full-field digital mammography, uses computers and specially designed digital detectors to produce images that are displayed on a high-resolution computer monitor and stored like other computer files. From a patient’s point of view, the procedure is very similar to a conventional screen film mammogram. 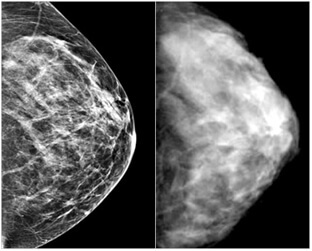 Both use compression and x-rays to create images of the inside of the breast. Unlike film-based mammography however, digital mammograms produce images that appear on the technologist’s monitor in a matter of seconds. Our radiologists are able to refine the digital image and obtain a more detailed and accurate assessment of certain findings, such as calcifications and subtle masses. Since there’s no waiting for film to develop, there’s usually less time spent in the breast-imaging suite. Women at a greater than 20% lifetime risk (high risk) should get an MRI and a mammogram every year. The American Cancer Society recommends that this screening program should begin at age 30 and continue for as long as a women is in good health; however, there is limited evidence about the best age to start screening. Women who have been determined to be at high risk should consult their health care provider to decide on the right screening regimen for them, taking personal circumstances and preferences into consideration. Women at a 15% to 20% lifetime risk (moderate risk) should talk with their health care providers about the benefits and limitations of adding MRI screening to their yearly mammogram. Breast self-examination is an option for women starting in their 20s. Women should be told about the benefits and limitations of a BSE. Women should report any breast changes to their health professional right away. No Deodrant, lotions or powders used on the chest and arm areas on the day of the exam.